If you are a student or someone wishing to get started in film and television production, Airpark TV will be seeking select qualified apprentices. The production itself was designed with the intention of offering professional apprenticeships to individuals who have proven their interest in film and television production and are dedicated to learning the craft. Candidates will be interviewed by a panel of professionals on the project, and selected based upon their demonstration of the right attitude, and willingness to do what it takes to get a project done. The typical student, who has no sense of responsiblity, work ethic or a sense of urgency, will not qualify. We are only seeking individuals who can make things happen and do what it takes to get projects completed. We seek individuals who have personal integrity, know right from wrong, and who can think things through. We seek youth who have a tremendous sense of maturity, responsibilty and can give 100% to the project. 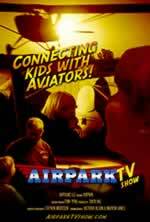 Airpark TV is NOT affiliated with any educational institution, public program. We do NOT take government money in any way shape or form. If you are interested in being considered, you must follow these instructions. You are to send a PRINTED resume, cover letter and 500 word essay on why you want to be in film and television and what you think it takes to be sucessful. You should also include a DVD data disc with an H.264 file of any demo work you may have. Do NOT call or send emails to follow-up. Only printed mail will be responded to. Emailed, text, telephone or other electronic inquiries will be ignored.